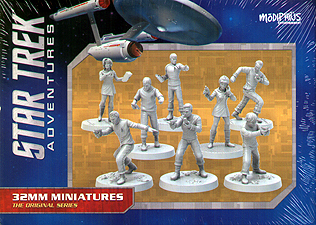 10 highly detailed, 32mm scale, unpainted resin miniatures of the crew of the USS Enterprise NCC-1701 for use with Star Trek Adventures the tabletop roleplaying game. This set contains Captain Kirk, Commander Spock, Lieutenant Commander Montgomery Scott, Lieutenant Uhura, Lieutenant Sulu, Dr. "Bones" McCoy, Nurse Christine Chapel, and Ensign Chekov. Some assembly may be require.